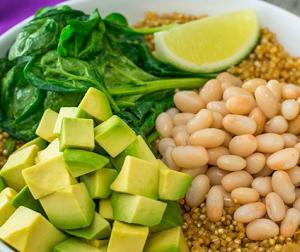 This recipe is a delicious, plant-packed breakfast version of the popular quinoa bowl. Make your morning easy by prepping the quinoa pilaf in advance. 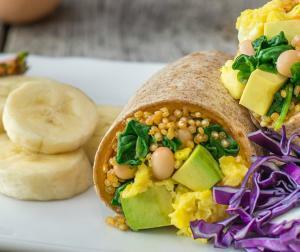 You can also use the quinoa mixture to make the tasty and portable Avocado Quinoa Breakfast Burritos recipe. Recipes created for the Hass Avocado Board by Julia Nordgren MD, physician and trained chef. Heat 2 teaspoons of oil in a heavy-bottomed saucepan. Add onion and cook over medium heat until soft, about 3 to 4 minutes. Add minced garlic and cook 1 minute more. Add smoked paprika. Stir and cook 1 more minute. Add rinsed quinoa and stir to combine. Add the vegetable stock and bring to a boil. Reduce heat, cover, and let simmer 10-15 minutes. Uncover and fluff with a fork. Reserve and set aside 1/4 cup of the smoky quinoa mixture to make the Avocado Quinoa Breakfast Burritos. Sprinkle the cubed avocado with lime juice and a pinch of kosher salt. Mix gently and set aside. In a separate sautée pan, heat the remaining olive oil. Add white beans and spinach. Cook over medium heat until the beans are heated through and spinach is wilted. Add the quinoa pilaf, stir to combine, and then spoon into serving bowls. Top each bowl with a generous spoonful of the cubed avocado. Quinoa mixture can be made in advance and stored in an air-tight container in the refrigerator for up to 5 days. Note: Large avocados are recommended for this recipe. A large avocado averages about 8 ounces. If using smaller or larger size avocados adjust the quantity accordingly. In a large skillet, warm the tortillas and add grated cheese; set aside. In a separate skillet, add smoky quinoa pilaf mixture from the Smoky Avocado Quinoa Breakfast Bowl. Crack eggs into the pan and stir with a flat-bottomed wooden spatula until they are cooked through and incorporated into the quinoa mixture. Add quinoa mixture and cubed avocado to tortillas. Top with shredded red cabbage for an extra crunchy burrito. Your burritos look amazing. I could easily imagine these for lunch or dinner too. That looks really tasty and I like the idea of serving it for breakfast, thinking it would be awesome for lunch too with a glass of lemonade. Oh yes Carole sounds good! This is my kind of comfort food! Yum! Thank you for sharing this healthy and delicious Smoky Avocado Quinoa Breakfast Bowl and Avocado Quinoa Breakfast Burritos recipe with us at the Plant-Based Potluck Party. I'm pinning and sharing. Just a note to let you know that I have chosen your post as one of my features for this weeks Real Food Fridays blog hop that goes live every Thursday @ 7 pm EST. Thank you for sharing your valuable information with us on Real Food Fridays blog hop. Have a healthy, happy, safe, & blessed July 4th weekend! Wow! I am honored.thank you! Have a wonderful 4th!